In some ways, denture care is a lot like mouth care. If you need help cleaning them for you or your patient, read on. It may seem really simple, but there are a few things you should know. 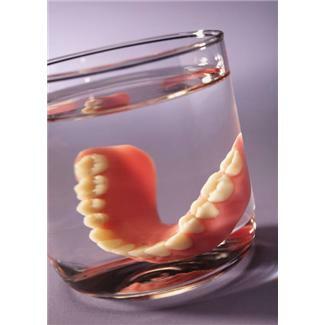 First of all, dentures are very expensive and at the same time, very fragile so handle them very carefully. All it takes is one short drop and they can break beyond repair. No two pairs are the same so they can't be replaced instantly. Not to mention you or the company you work for may have to replace them. 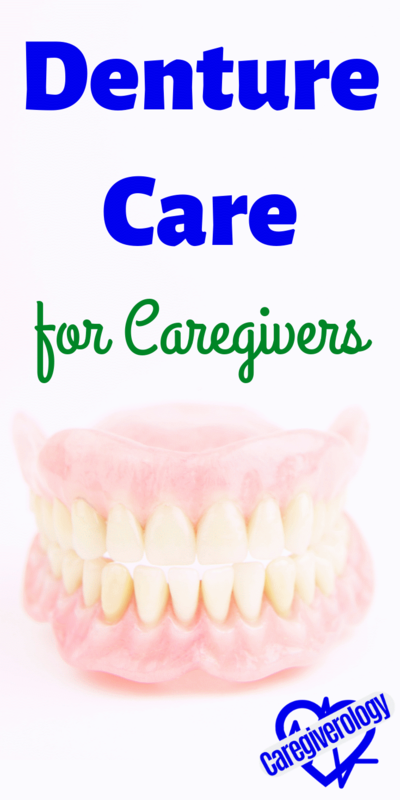 There are a few different ways to give denture care. One way is to soak them in a cup of cold or slightly warm water with denture cleaning tablets. Just make sure the cup you use is very easily recognizable as a cup for dentures. 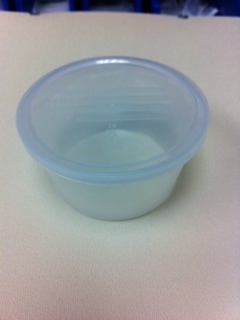 Working at a hospital, we use a specific clear cup that we put the patient's label on. That way, none of them get mixed up or worse, accidently thrown away. The amount of time you should let them soak varies depending on the tablets. Some only require a few minutes while others require a few hours. Many patients will take their dentures out at night and soak them until morning. A more effective way to provide denture care is to brush them similarly to brushing actual teeth. Use this method if they have visible pieces of food on them. First, have your patient take out their dentures or take them out for them if they need assistance. Just be sure you are qualified to take them out. Certified Nursing Assistants (CNAs) usually aren't allowed to take them out or put them back in. If you are allowed, be very gentle with the dentures as well as the inside of their mouth and make sure you don't get bitten. Then bring them over to the bathroom sink where you will be performing denture care, but before you begin, place a few paper towels or a washcloth at the bottom of the sink. That way, if you do accidentally drop them, they won't shatter into a dozen pieces. For best results, use what's called a denture brush. They are similar to a regular toothbrush only they have two sets of bristles at one end. The side with the least amount of bristles is used for the inside of the dentures where your patient's gums go. If one is not available, a toothbrush with soft bristles will work, just not as well. Note that some bristles may scratch or damage them. You should use toothpaste that is designed specifically for dentures if you use any at all. Some patients brush their dentures to get rid of loose food and soak them with denture tablets to cleanse them. Always use cold or slightly warm water not only for soaking them overnight, but also before and during brushing them manually. Hot water causes dentures to warp and change shape. If this happens, you can't reverse it. They'll have to be replaced. Use the side with more bristles to brush the dentures starting at the gums and brush with a downwards stroke to the bottom of the teeth. You can now do this easily for the front and back of the teeth since denture care is done outside of the patient's mouth. Don't forget to brush the top of the teeth as well. A back and forth motion from the ends to the middle of the dentures works just fine. Next use the side with less bristles to brush the inside where your patient puts their gums. Do this like the top of the teeth, back and forth only get the sides as well as the bottom of this area. For upper dentures, brush the area that lines the top of the mouth, or the upper plate, as well. Providing denture care in a hospital, I know some patients like to apply denture adhesive before putting their dentures back in their mouth. Just make sure you dry them with a paper towel or washcloth before applying the paste. The amount to put on them varies from person to person but a general amount would be two or three thin lines lining the area where the gums go. For upper dentures, put a line or two on the upper plate as well. If your patient is alert, show them and ask if it is too much or too little before they put them in their mouth. Otherwise, if they keep slipping off your patient's gums, use more. But if the adhesive is visibly squeezing out of the dentures, use less.